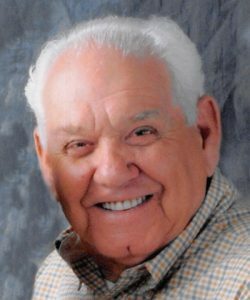 John O. Mondino, Jr., 90, died Monday, February 18, 2019, at Webster Manor Nursing Home in Webster. He is survived by his wife of 63 years, Gloria A. (Christie) Mondino of Oxford; three daughters, Karen J. Mondino of Roseville, CA, Sandra J. Buron and her husband Michael of Glocester, RI, and Paula M. Mondino of Webster; a brother, Melvin P. Mondino of Webster; three grandchildren, Derrick Buron and his wife Alexandra of Springfield, VT, Nathanael Buron and his partner Christine Dooley of Northampton, and Nicole Cabral and her husband Kevin of Easton; three great-grandchildren, Ashley Cabral, Luke Cabral, and Ava Buron; many nephews and nieces; and his favorite grand dog, Ellie. He was predeceased by a brother, Alton Mondino and his wife Anne; and a sister, Barbara Seavey and her husband Donald. He was born in Worcester, son of the late John O. and Helen S. (Hood) Mondino, and lived in Worcester before moving to Oxford in 1968. He attended Worcester Boys Trade High School in Worcester. He was a U.S. Navy veteran of World War II. Mr. Mondino was an operating engineer at E.J. Cross Construction Company for 44 years, retiring in 1991. He enjoyed working on antique cars and trips to the casino. He was an avid outdoorsman and loved working in his garden. A private graveside service will be held at Worcester County Memorial Park in Paxton. There are no calling hours. In lieu of flowers, memorial contributions may be made to Veteran’s Inc., 69 Grove St., Worcester, MA 01605. Paradis-Givner Funeral Home in Oxford is directing the arrangements.